It sure is hot out there. In Azusa where we have our corporate offices, it is already 96 degrees at 10:30am and is predicted to go up to 105 today--only two degrees cooler than yesterday. 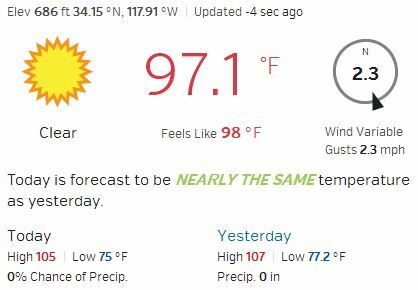 UPDATE: By the time this blog was published, it was 97 degrees! Of course, as you will hear people from this area always say, "It's a dry heat." Humidity here is at a low 35%. It's hard to imagine how bad these temperatures would feel on the East Coast or in the South where humidity can go as high as 90%. Temperatures like these in high humidity conditions are perfect for mold growth. All it takes is a little moisture to let ever-present spores take hold. We're not going to get a lot of mold growth outdoors here until we get some rain. But what about indoors? Condensation from air conditioners may be the only moisture mold spores are getting during a dry heatwave, but with air conditioners constantly running--especially at night--condensation definitely brings a risk of mold. Steam from the bathroom--If your family is like mine, they are taking more showers during the heatwave than they do when the weather is more temperate. Even the smallest exertion is making us all feel sweaty. All those showers are increasing the humidity inside, which can give mold a chance. Don't forget to run the ventilation fan in the bathroom during showers and for a while afterwards to vent the water vapor outside. Cooking--The appeal of hot food is pretty limited right now, but if you are cooking on the stove, you are probably creating some water vapor. Run the fan over your stove when you are cooking. Not only will it get any excess humidity out of the house, it will also vent the air pollution that comes from cooking on a gas stove to the outdoors while the windows are closed to keep the air conditioning in. We are all hoping for a break in this heat, but it looks like we have a couple of days to go. I wish I were going up to the mountains this weekend with my daughter's school group. It's supposed to be 74 degrees up there on Saturday. Doesn't that sound heavenly?